Home » Police Force » Delhi Police Constable bharti 2017 total 4669 posts. Delhi Police Constable bharti 2017 total 4669 posts. Constable recruitment in Delhi Police male and female candidates can apply fot temporary constable post. The staff Selection Commission will conduct Computer based written examination. The Examination is being advertised by SSC based on vacancies intimated by Delhi Police. ii) Application from candidates will be accepted through ON-LINE MODE only. iii) Physical Endurance and Measurement Test (PE&MT) will be scheduled and conducted by Delhi Police region-wise at various places in the country. Call letters for PE&MT to candidates will be uploaded by Delhi Police. iv) The Commission will conduct Computer based written examination of candidates who have qualified in PE&MT. v) Computer based Written Examination will be in English & Hindi only. vi) Call letters for Computer based written examination will be issued by SSC. vii) The Commission will process and declare the result of Computer based written examination and the merit list of candidates will be provided to Delhi Police for further Detailed Medical Examination (DME) and Police Verification. 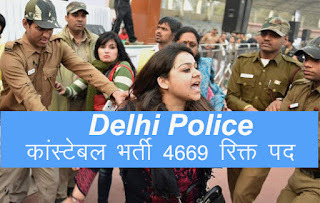 viii) Delhi Police will issue call letters and conduct DME and Review Medical Examination (RME). ix) Collection of documents from the candidates and their verification will be done by the Delhi Police at the time of issuing of offer of Appointment Letter. of Computer based written examination and preparation of merit list would be handled by SSC. xi) Court cases/RTI/Public Grievances relating to all other issues vacancies, conduct of PE&MT, Detailed Medical Examination, Review Medical Examination, Police Verification of candidates will be handled by Delhi Police. will be called for the Computer based Written Examination, scheduled to be held on 04.03.2017 onwards. and other allowances as admissible. Computer based written examination will be conducted by Staff Selection Commission.